Spot Cool Stuff scours the world, virtually and in-person, looking for places, products and concepts with a WOW! factor. We do that professionally. We do that constantly. And we’re still surprised how often we come across ideas that are incredibly cool yet seem incredibly simple. 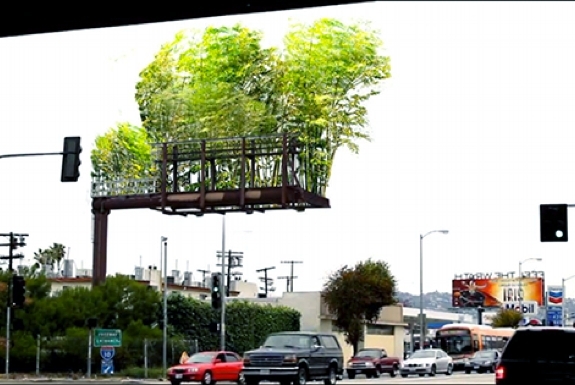 Like this one: Taking billboards and converting them into bamboo gardens. The project is called Urban Air and it is the work artist Stephen Glassman. Glassman lives in Los Angeles where, for the past two decades, he’s responded to various tragedies that have struck the area in the way true artists do — with art. Specifically, with artistic bamboo installations. After the Rodney King riots (further) destroyed areas of South Central Los Angeles, Glassman beautified a small section of it with a bamboo garden. He did the same in Malibu after it experienced horrible fires. And in Northridge after its earthquake. Billboards are, in a sense, an ongoing tragedy. 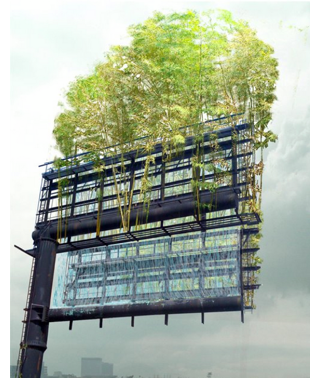 So Glassman set his sights a little higher and turned one of the suspended advertisements into a bushy, bamboo-filled green garden. The process of doing that is not as simple as it sounds. Gardens needs soil and moisture. And there are structural concerns — all that bamboo is heavy. Plus, these are high tech gardens. Each includes air quality monitors (the data from which will be made public). The instillation is also a wifi hotpot, perhaps in the hope of make it an unlikely gathering place for the geeky. Urban Air is currently trying to raise funds on Kickstarter — check out their fund raising video, below. The project has already succeeded in raising the public’s interest. Summit Media has agreed to donate some of its billboards to the cause. And interest as poured in from around the world from cities wanting their own billboard garden. What an amazing, thought provoking idea. Why cant we get more nature involved in our daily work. Most people dont even bring a plant to work. i mean most people are out of work but those who are working fail to bring plants or nature in their world. I dont think its right.